The Greek parliament on Saturday overwhelmingly approved a package of reforms and austerity measures the Greek people overwhelmingly rejected in a referendum a week ago. Five sixths of parliament - 251 deputies - voted in favour, compared to the 61.5 percent of the Greek people who voted against the measures the previous Sunday. The vote was controversial for the ruling leftwing Syriza party, which suffered two No votes and eight abstentions, including those of two cabinet members. Greek Prime Minister Alexis Tsipras in expected to travel to Brussels on Saturday to meet with his country’s creditors again, and try to hammer out a deal. Tsipras described the measures he’s passed as difficult, and the talks that lie ahead as a minefield. But he has one powerful argument as he walks into them. He’s now taken the ultimate political risk of going against his people and his election promises, and adopted €12bn of spending cuts and new taxes that could plunge the Greek economy back into recession. Just how politically expensive the government's choice to pass the measures through parliament is, is amply demonstrated by an opinion poll taken by Bridging Europe, a think-tank on European affairs. 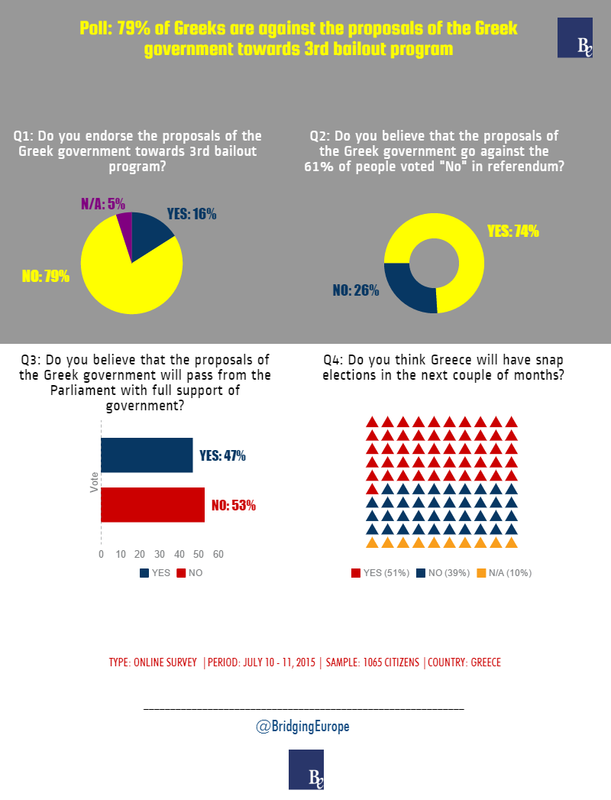 More than three quarters of Greeks are against the measures Syriza passed, and half of them expect the government to fall. With this, Tsipras hopes to coax from creditors an investment package worth three times as much as the austerity he taken on; and even more than this, to get them to extend the repayment period for the Greek debt, from 16 years to at least 40, which the International Monetary Fund has supported to render it sustainable. All this must be agreed by Sunday. The most difficult issue is the debt extension. Even the anti-austerity ruling Syriza party says it wants to honour the debt in full, but that Greece cannot spend four percent of its economy doing so. Former finance minister Yanis Varoufakis recommended a figure of approximately 1.2 - 1.5 percent. Whatever the final figure creditors agree to, this means an extension of the repayment period from the current 16 to the IMF-recommended 40 or so. In November 2012, creditors even agreed to do as much, but on condition that a) Greece balance its budget and b) implement reforms. It has done the first for the past two years, and the legislation of an entire package of reforms prior to this weekend’s discussion, it can be argued, amounts to enough of a commitment to do the second. Tsipras may fail to get the entire package. It is likely that he will get a third, €52bn bailout loan which finances his government to the middle of 2018, and even the €35bn from Jean-Claude Juncker’s European Investment Fund because Juncker has already promised that; but he may get little more than a promise to discuss the debt, if Germany’s finance minister, Wolfgang Scheauble, insists on what some believe to be a deliberate strategy of forcing Greece out of the Eurozone. (Scheauble defends his emphasis on restructuring and competitiveness over easing money flows in a NYT article, but doesn't address the issue of debt sustainability. Paul Krugman offers a rebuttal on his blog). Should Tsipras bring home what he can, or play hardball and refuse anything except the entire package? 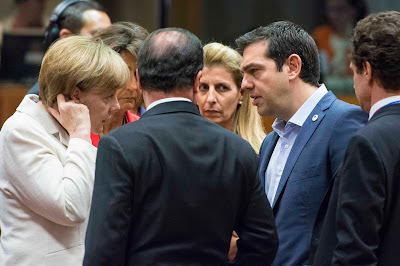 Greece tried hardball tactics and failed. Varoufakis spent six months stonewalling the single currency area’s finance ministers – the Eurogroup – and resisting reforms and austerity. It’s only in the last three weeks that Syriza has really discussed reform. The last hardball ploy was the referendum, which did not induce Germany to relent, because ultimately Germans are convinced of the benefits of a Greek exodus from the euro, and Greeks aren’t. After five months of fruitless talks and two weeks of bank closure, the Greek economy is now in desperate shape. Tsipras would do better to accept the financing he gets. The Greek economy will then be able to return to normality. 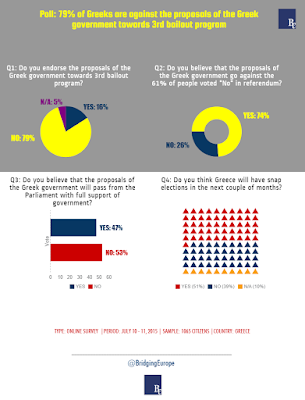 Tsipras should then use European and global public opinion with which to corner the hard-hearted Scheauble.